This online article from the National Trust for Historic Preservation is one of the first stories published announcing Arkansas State University’s acquisition of the Johnny Cash Boyhood Home in Dyess. For several years, the National Trust worked with Arkansas State University in an attempt to save the house as part of an Arkansas Delta Rural Heritage Development Initiative (RHDI). 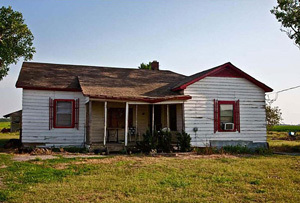 The article traces the history of the Cash family in Dyess, the deterioration of the home over the years, and efforts to work with the private owners to acquire the home. “The family recognized that the house might not make it through another season and the scope of work was beyond their abilities and resources,” says Beth Wiedower, RHDI director. The house will become part of the town’s master development plan, which includes restoration of other Works Progress Administration-era structures. For the complete article, click here.